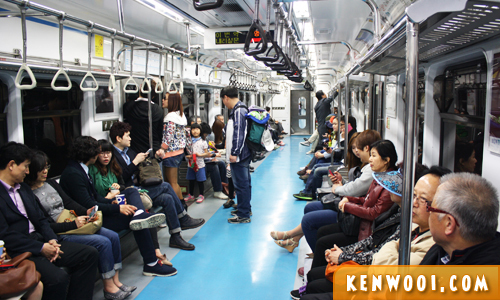 During our visit to Seoul, the preferred mode of transportation to travel around the city was the Seoul Subway, or also known as Seoul Metro Line. Once in South Korea, we traveled from Incheon International Airport to Seoul Station (the first subway station we set foot on) via the Airport Railroad (AREX). 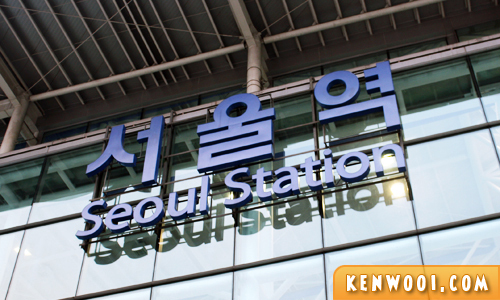 For your information, Seoul Station is similar to KL Sentral in Malaysia – it serves subway trains and long-distance trains. To travel conveniently around Seoul and NOT having to worry about manually purchasing tickets, we decided to purchase the T-money Card at KRW2,500 (RM7.13) each. 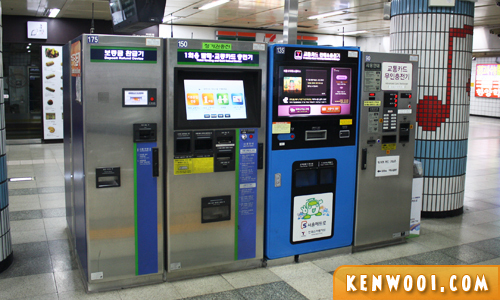 It is a transportation card and can be reloaded (or recharged, that’s what they use here) using the ticket vending machines located inside subway stations. T-money Cards can also be purchased and recharged as convenience stores, such as 7-Eleven, with the “T-money” signboard. 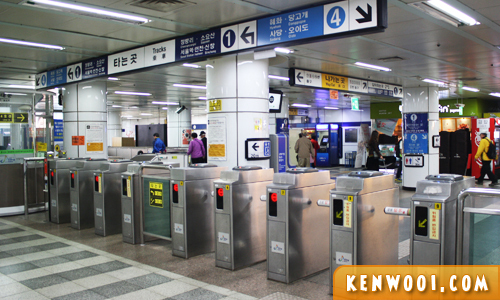 Besides that, subway stations in Seoul provide facilities like self-storage lockers, as well as attractions including shopping and exhibitions. 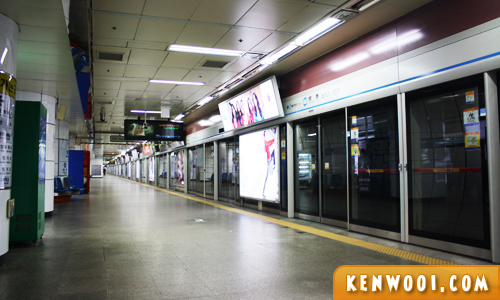 To explore Seoul, the subway offers a convenient way to do so. In fact, anyone will be able to comprehend the metropolitan subway systems. 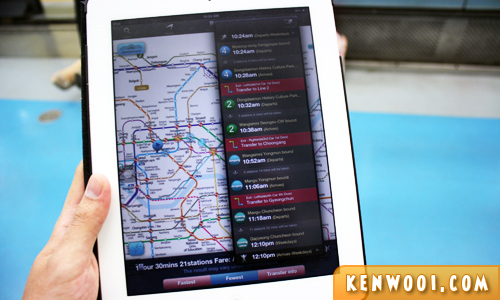 Subway maps can be obtained easily at the stations. Each subway station has a name, number and colour code, which represents the respective subway Line. Entrance to all subway stations are clearly marked – with Exit number and subway Lines available. Once in a subway station, travelers will pass through the security gates. The arrival of trains are pretty frequent and punctual, I must say – there was never once that the “Where’s the train? !” question pop in my mind. 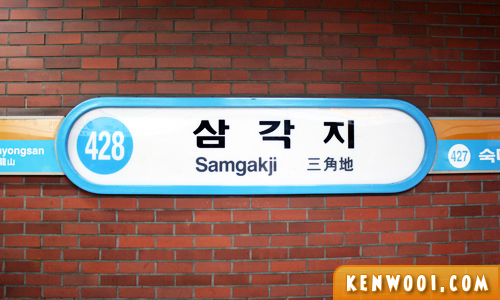 When a train is arriving, the station’s audio system will play a tune – normally a traditional Korean folk tune. Inside the train, it looks like any other metro trains – seats lined up along the sides with handles along the middle. 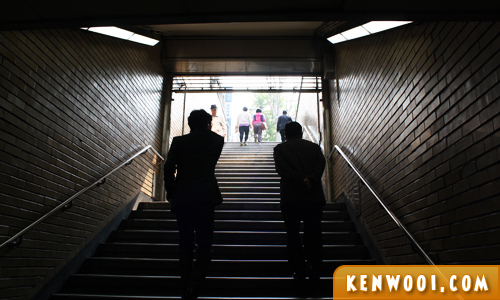 We stood most of the time in the train as the subway is highly used by Koreans – particularly the elders. For your info, the elder citizens are always on the go! 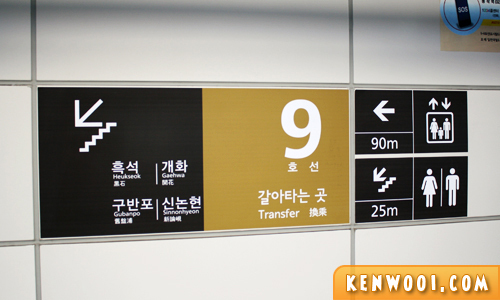 Even though we didn’t understand Korean language, the announcements made on the train, which indicates upcoming station, line transfer stations and exiting sides, are available in English as well – sometimes in Japanese and Chinese. In order to reach your destination, you may have to transfer to another Line. If you have a subway map with you, transfer stations (where two or more Lines intersect) are marked differently. 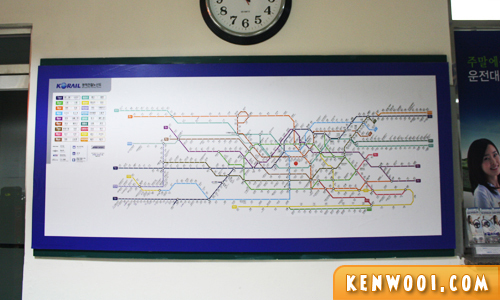 By looking at the subway map, you can determine your departure and arrival stations. 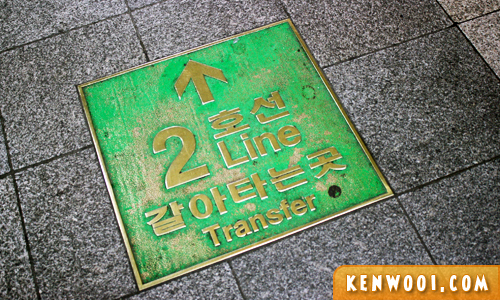 Since there are various Lines within Seoul itself, it’s quite common to transfer. Furthermore, there won’t be extra changes as long as you don’t exit the station (and it’s within 10km of your departure station). 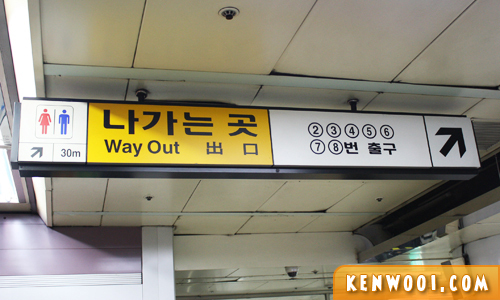 Once you have reached your arrival station, refer to the Exit signs to get out from the station. Typically a major subway station has multiple exits – with each exit leading travelers to different places surrounding the station. So if you’re going to a destination located somewhere around the station, take note of the right exit – that will take you to the closest exit to reach your destination. By the way, with an extensive integration of 19 Lines and over 600 stations, looking at the Seoul Subway for the first time can be daunting. Furthermore it’s generally in Korean! Just look at the whole subway map, scary or not? 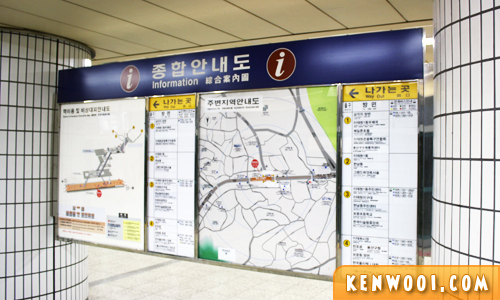 The Seoul Subway features an extensive directional signage and many informative boards such as surrounding neighbourhood map and tourist guides. Basically, the subway is absolutely tourist friendly! There’s an abundance of signage clearly indicating the direction and other necessities. As for Line transferring, just follow the signs and walk towards another boarding platform to board another train. Besides that, information boards are aplenty in and out of the subway stations. Well, it’s really easy to travel to nearby places in Seoul with the subway – till a point where we don’t have to refer to the map anymore. Okay, maybe some checking needed but still, we don’t have to hold the map 24/7! For further distance, say to Nami Island – which is 63km away from Seoul, I used an app as a guide – since there were many stations and transferring required. This “Subway Korea” iPhone/iPad app, also known as Jihachul, is probably the best subway map for Korea that provides users the subway information such as stations, timetable, departure and arrival routes, transfer details and an interactive map! 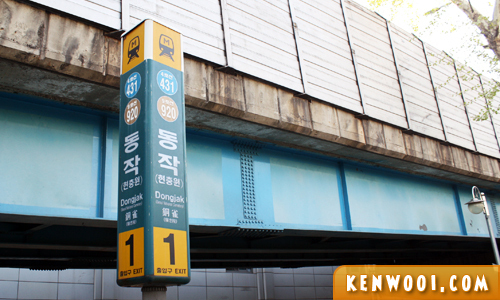 Even though one can travel around Seoul by taxis or buses, I can definitely say that traveling with the Seoul Subway gives us a peace of mind. Other than traveling around, some stations can be an interesting place to have fun. 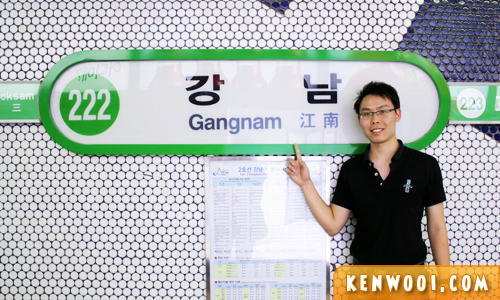 For example, the Gangnam station – I WAS THERE! Oh wait… you expected me to do the Gangnam Style pose? and… lets see how our MRT will stack up. After all we were supposed to be on par with SK in the 80s.